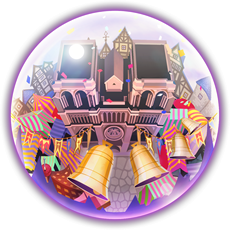 La Cité des Cloches (Fra: "The City of Bells") is a Sleeping World that is featured in Kingdom Hearts 3D: Dream Drop Distance. It is based on the Disney film, The Hunchback of Notre Dame. The world previously appeared in the comic The Sceptre and the Kingdom. Both Sora and Riku arrive to La Cité des Cloches at the Square, a large plaza in front of the Cathedral that dominates the world's skyline. The area is covered in many tents and banners, as well as a stage, presumably set up for the Festival of Fools. The ground floor of the Cathedral is the Nave, which comprises a large portion of its interior. It is a large area full of pillars and stained glass windows. The upper section of the Nave can be accessed by using Faithline or by using Flowmotion. Heading up the stairs near the entrance brings you to the roof of the Cathedral (labeled as part of the Square). Inside the door on the right side of the left tower is the Bell Tower, where Quasimodo lives. At the top of the Bell Tower lies two large bells. Heading the opposite way of the Cathedral leads into the Town, a large residential district. Beyond the Town lies the Bridge, which stretches over the River Seine. At the end of the Bridge is the Outskirts, a more dilapidated part of the world. Like the Town, it is full of residential buildings and large scaffoldings blocking some alleyways. From the Outskirts, the world diverges. Sora heads into the Graveyard Gate, the entrance of the graveyard that leads into the winding Tunnels under the city. At the end of the Tunnels is the entrance to the Old Graveyard, where one grave serves as the secret entrance into the Catacombs, large winding tunnels filled with skeletons. At the end is the entrance to the Court of Miracles, a tent and street cart-filled area where the gypsies have taken refuge at. Once Riku arrives at the Outskirts, instead of heading towards the Graveyard Gate, he is chased to the Windmill, a muddy, hilly area where the only notable landmarks is a small cottage sitting beside a large windmill. Sometime after Terra-Xehanort's descent into darkness, his Heartless, Ansem, Seeker of Darkness, attacked many worlds, including La Cité des Cloches. These worlds were then swallowed by the darkness. Though it was restored after Sora defeated Ansem and destroyed the End of the World, La Cité des Cloches remained in a state of deep sleep instead of returning to the Realm of Light, plagued by Nightmare Dream Eaters. Riku advises Quasimodo to listen to his heart. After Riku arrives at the city, Esmeralda passes him while fleeing Phoebus, who is pursuing her under Frollo's orders. Riku tells Phoebus he has not seen a gypsy woman pass, and he leaves to report to Frollo. Esmeralda returns to thank Riku and describes Frollo's obsession with destroying the gypsies. She advises him to go to Notre Dame for answers. At the cathedral, Riku encounters Quasimodo, who tells him that Frollo is at the Outskirts of the city. Quasimodo tells Riku that Frollo protects him from the outside world, but Riku tells him that he should go out and find friends that can see past his appearance. He tells Quasimodo to think about what is really keeping him from leaving Notre Dame. Meanwhile, Sora arrives in the city on his side of the world, and he passes Claude Frollo on the street. Frollo suspects Sora to be a gypsy due to his clothes and stops him, but he is interrupted by Captain Phoebus, who reports monsters invading the Town Square. Sora runs off to the square, followed by Phoebus, while Frollo voices his disgust over the gypsies and other "vermin" overrunning the city, darkness swirling around him. Quasimodo refuses to run (as Sora tells him to do) because he's been crowned the King of Fools. In the square, Sora finds Quasimodo happily riding a Zolephant, with other Nightmares grouped around them. Sora tells Quasimodo to run, but he blithely refuses to leave the festival since he has been crowned King of Fools. When Frollo appears in the square and furiously calls to Quasimodo, the Dream Eaters become hostile, and Quasimodo is thrown to the ground. Sora rushes in to fight off the Dream Eaters, while Esmeralda takes Quasimodo into Notre Dame. After clearing the square, Sora enters the cathedral to check on Quasimodo. He finds him with Esmeralda in the Bell Tower, where the hunchback is showing the gypsy the bells. Victor, Hugo, and Laverne remark to Sora how tough Quasimodo is. Quasimodo tries to convince Esmeralda to stay, but when she insists on leaving, he agrees to get her past the soldiers outside and they leave through the window. The gargoyles explain to Sora that Frollo does not allow him to leave the cathedral due to his appearance, and that it took a great deal of courage for him to go to the Feast of Fools. Laverne worries that what happened in the square will discourage Quasimodo from trying again, and Sora decides to talk to Quasimodo, to make sure he doesn't give up. In the meantime, Riku heads for the Outskirts in search of Frollo. At the Bridge, Riku encounters the Wargoyle, which begins to fire down at him from above, forcing Riku to run. At the Outskirts, Phoebus refuses to let Frollo attack the home of a family that aided gypsies, just before the Wargoyle arrives with Riku in pursuit. Frollo claims the Dream Eater is a divine power granted to him in order to wipe out the gypsies, refuting Riku's claim that he is too far gone and he leaves. Phoebus attempts to stop the Wargoyle from following Frollo, but he is quickly incapacitated. Riku heads off to stop Frollo, and a grateful Phoebus points him towards the cathedral. Phoebus reveals that Frollo intends to eradicate all the gypsies at their hideout. Back on Sora's side, Sora encounters Phoebus, no longer captain, outside the cathedral. Phoebus is upset to hear that Esmeralda is no longer in Notre Dame, explaining that Frollo is planning to attack the gypsies in their haven, the Court of Miracles. Quasimodo overhears and tells them that Esmeralda gave him a pendant as a guide to the Court. Upon realizing the pendant is a map, the three of them head off to warn her of the danger. They arrive at the Court of Miracles and find Esmeralda, but Frollo arrives with Dream Eaters at his command, having followed the three of them to the Court. He takes Esmeralda to be burned in the square, and he summons a large Nightmare that knocks out Sora when he tries to stop him. Sora regains consciousness some time later in the empty Court, and he takes off for the square. He arrives to find Esmeralda tied to a stake, the fire already burning, but Quasimodo swings down from the tower, frees Esmeralda, and carries her limp form to the top of the cathedral, claiming sanctuary. Frollo runs into the cathedral with Sora in pursuit. Meanwhile, Riku meets up with Quasimodo at the square, who has saved Esmeralda from being burned at the stake. Quasimodo directs him to the top of the cathedral to find the Wargoyle. Riku tells Quasimodo to stay with Esmeralda, but is happy to see Quasimodo follow his heart. Inside, Riku finds Victor, Hugo, and Laverne taking out Dream Eaters, and he heads for the roof. Ansem exhorts Riku to embrace the darkness or share Frollo's fate. Riku finds Frollo reveling in the sight of the burning city. Frollo's darkness calls the Wargoyle to the top of Notre Dame, and its sudden appearance sends Frollo plummeting to the ground below. Ansem and the young Xehanort appear and mock Riku, telling him he is still afraid of the darkness, but Riku counters that he walks the road to dawn. They depart in a Corridor of Darkness, while Riku reassures himself that he has nothing to fear as long as he wields the Keyblade. Riku proceeds to fight and defeat the Wargoyle, sending it falling into the flames below as its wings shatter and fall off. On Sora's side, Sora attempts to reach the cathedral, but the Wargoyle falls from the tower, blocking Sora from following Frollo. While Sora defeats the giant Nightmare, Frollo confronts Quasimodo and Esmeralda at the top of Notre Dame. He attempts to strike down Quasimodo, knocking them off the ledge. Esmeralda grabs Quasimodo's hand, while Frollo tries to attack again from atop a gargoyle. However, the gargoyle breaks off from the wall, sending Frollo falling into the conflagration below. Esmeralda loses her grip on Quasimodo, but he is saved by Phoebus below, who pulls Quasimodo to safety. The three reunite, with Quasimodo blessing Phoebus and Esmeralda's relationship. As the two of them leave together, Quasimodo tells Sora that he is ready to face the world outside and leaves Notre Dame. Alone in the Nave, Sora is suddenly confronted by the young Xehanort and a vision of Vanitas, who accuse Sora of making his heart a prison, even if he himself is not the prisoner, referring to Ventus. Confused by their words, Sora unlocks the Keyhole that appears. Afterwards, on his side, Riku speaks with Quasimodo, Esmeralda, and Phoebus. Quasimodo thanks Riku for making him realize that he was the one who trapped himself with the fear in his heart. Phoebus notes that Riku still keeps a lot locked inside his heart, and Esmeralda comforts Riku by saying that everyone has things they keep to themselves until they can sort them out. Asserting that he knows the path he must take, Riku unlocks the Keyhole that appears. In The Sceptre and the Kingdom, Sora and Riku arrive at La Cité des Cloches by mistake while chasing the villain who had stolen the Disney Fairies' sceptre from Disney Castle, when Donald is unable to send them to their intended destination. The two boys appear out of nowhere and fall on top of Judge Frollo, who accuses them of being witches. They flee from Frollo and are rescued by Esmeralda, who leads them to the Cathedral of Notre Dame where they meet Quasimodo. Finally, after asking how to find a door to their world, the gargoyle Laverne guides them towards their true destination. The gargoyle that breaks of from the cathedral and leads Frollo to his end. Frollo's guards appear in The Sceptre and the Kingdom comic. The Archdeacon and Quasimodo's mother are mentioned in Kingdom Hearts 3D: Dream Drop Distance. In the cutscene after Sora defeats the Wargoyle, Quasimodo falls from Esmeralda's grasp, but is caught by Phoebus. However, he falls from the roof of the Cathedral and is caught at the supports below the roof between the bell towers. Once Phoebus pulls him up, they are back at the roof of the Cathedral. ↑ Kingdom Hearts 3D: Dream Drop Distance, Quasimodo: "Oh. M-my name's Quasimodo. I'm very sorry, but the Archdeacon is away." ↑ Kingdom Hearts 3D: Dream Drop Distance, Claude Frollo: "I should have known you'd risk your life to save that gypsy witch—just as your mother died in her pitiful attempt to save you."